Here's some some razor-laden apples to bob for this Halloween season. 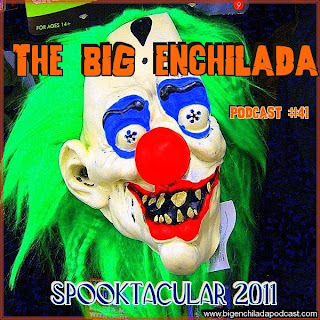 It's the 2001 Big Enchilada Spooktacular to help you keep the true spirit of this holiday in your heart. This also marks my third anniversary of doing this silly show. So come on, podlubbers, let's get creeped out together! * Songs so marked are from the fabulous Best of The GaragePunk compilations, Click on the links over the songs -- as opposed to the ones over the artists -- to get to the correct compilation. Then do yourself a favor and buy some of these comps.